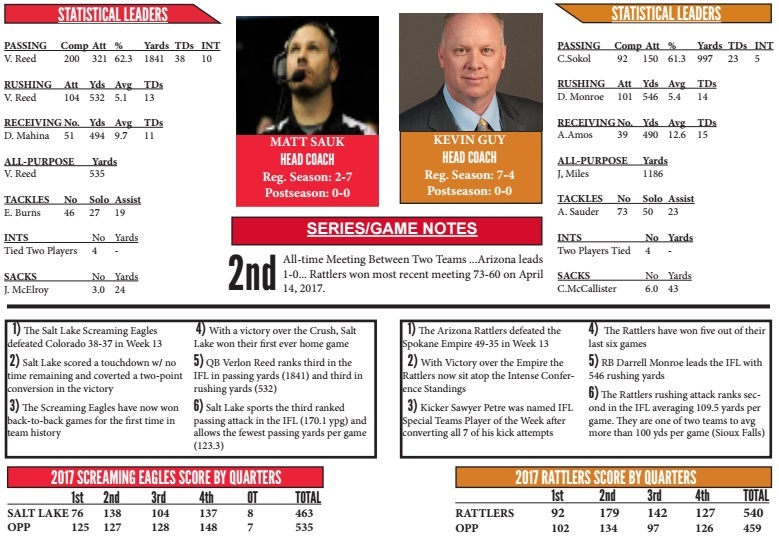 What: The Screaming Eagles make their only trip of the season to Phoenix to face the Rattlers. When: Saturday, May 20 at 6 p.m. (PST). 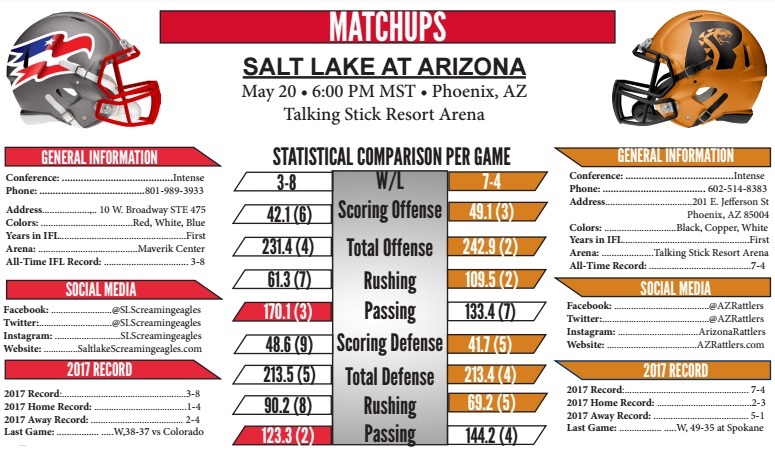 Head to Head: Rattlers lead series 1-0 (this is the first game between the teams in Arizona). Season Results: April 14 - Rattlers 73, Screaming Eagles 60. Note: All three of the Screaming Eagles' wins this season have been over the Colorado Crush. The Screaming Eagles are 3-8 overall, 2-4 on the road and 3-7 in Intense Conference play. Salt Lake is coming off a 38-37 home win over the Colorado Crush on May 12. They are averaging 42.1 points per game and are allowing 48.6 points per game. The Screaming Eagles are fourth in the Intense Conference. The Rattlers are 7-4 overall, 2-3 at home and 4-1 in Intense Conference play. Arizona is coming off a 49-35 road win over the Spokane Empire on May 12. They are averaging 49.1 points per game and are allowing 41.7 points per game. The Rattlers are tied for first in the Intense Conference. 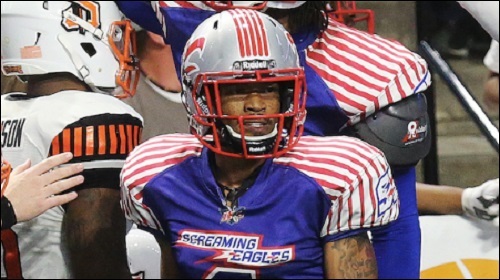 The Screaming Eagles are flying high after a pair of wins over the Colorado Crush. On May 8, they were dominant in all areas of the game as they dispatched the Crush 64-41 in Colorado. Just five days later, they scored on a last-second play, and added a two-point conversion to escape with a 38-37 win in Salt Lake City. Now, they face the Rattlers, who share the Intense conference lead with the Spokane Empire. Salt Lake is technically not out of the playoff race, just four games back of the Rattlers and Empire. A late season run could make the playoff race all that more interesting. They are still a long shot, but what was once a season in a downward spiral, could be salvaged into respectability with some wins down the stretch. That all starts with the Rattlers, who pushed back the Screaming Eagles by a score of 73-60 in week 9. It seems to be a familiar sentiment in these previews that as Verlon Reed goes, so does the Screaming Eagles offense. Reed, a leading candidate for IFL Offensive Rookie of the Year, is second in passing yards with 167.4 per game. He's tied for third with 38 touchdown passes on the season. Reed also is third in the IFL with 48.4 rushing yards per game and 532 rushing yards per game, and tied for third with 13 rushing touchdowns on the season. Reed has been spectacular in all three of Salt Lake's wins, leading the team to two clutch fourth quarter/overtime comeback wins. He'll have to be on top of his game in order to out dual a fierce Rattlers defense. BYU alum Devin Mahina has turned into the primary target for Reed. Mahina has 51 catches for 494 yards and 11 touchdowns. Juwan Dotson has 34 catches for 247 yards and six scores. As with last week's win, Dotson may not see time on offense, however, according to head coach Matthew Sauk, who told SCtoC's Bannock on May 15 that he feels defensive back may be a more natural position for him. Dotson had an interception against Crush quarterback Sean Goldrich last week. Expect Devon Price and Chris Robinson to get a crack into the receiving corps here. James "Bubba" Poole is the biggest threat, aside from Reed, in the running game. On defense, the Screaming Eagles have built a strong secondary with Ed Burns, Rashad Green and James Calhoun. Calhoun missed last week's game due to injury (forcing Sauk to move Dotson to defense. ), so his status in this one is unclear. Eight different Screaming Eagles players have intercepted opponents' passes this season. In just three games with Salt Lake, Jerome McElroy has assumed the lead in sacks with three. Ben Compton has 2.5 of his own. Compton leads the team in tackles for a loss with 4.5 and has a fumble recovery this season, And Seante Williams has four tackles for a loss. If Calhoun plays, either he or Robinson would likely be relied upon to return kickoffs. The Screaming Eagles are the most penalized team in the league with 119 infractions costing them 844 yards. Limiting those penalties will be a huge key to a win in this one. The defense will need to be opportunistic. Forcing a couple turnovers could prove to be a major boost, should the offense be able to capitalize on them. 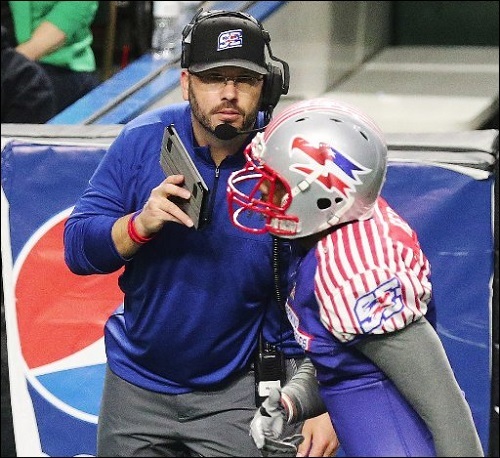 Arizona is looking to make a splash in its first season in the IFL. 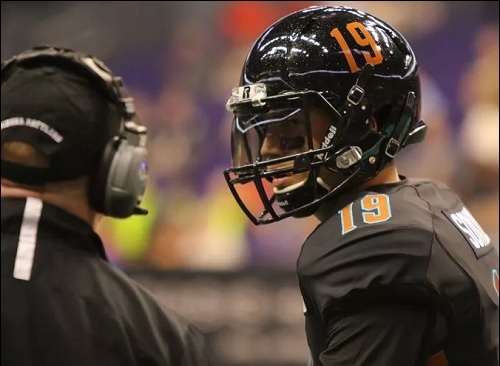 After a slow starts where the Rattlers dropped their first two games, they've won seven of their last nine, including a 49-35 upset of the Spokane Empire last week. That victory pulled them to within a tie with the Empire with identical 7-4 records. All four of the Rattlers' losses this season have come to teams which boast winning records heading into week 14. Arizona is a historical franchise and are celebrating their 25th anniversary as a franchise. Their first season was in the Arena Football League in 1992, a league in which they played their first 24 seasons. In the AFL, the Rattlers have won five ArenaBowls, have eight conference championships and 21 playoff appearances. They hope to continue that success as a member of the IFL, beginning this season. Unlike in its AFL days, this is a team which relies heavily on the run. They are second to only the defending champion Sioux Falls Storm with 109.9 rushing yards per game. Much of that mantel has fallen upon Darrell Monroe, who has been outstanding in his nine games with the team, rushing for 583 yards on 101 carries and 14 touchdowns. His 60.7 rushing yards per game are best in the IFL. Monroe has caught 11 passes for 89 yards and a touchdown. Cody Sokol has been efficient since taking over for Darron Thomas at quarterback. He's completed 61.3 percent of his passes, and has 23 touchdowns against just five interceptions. Anthony Amos, a holdover from the Rattlers' AFL days, is Sokol's go-to receiver and his always a threat to make a big play. Jamal Miles has 32 receptions for 304 yards and six touchdowns. Adam Sauder leads the team with 61.5 total tackles, and also has six pass breakups and two fumble recoveries. Arkeith Brown is close behind with 58 total tackles. Brown, who has eight pass breakups, and former Portland Steel defensive back Allen Chapman each have four interceptions. Chris McCallister and Joshua Gordon have combined for 11 sacks on the season. Miles could make an impact in the kick return game. he's already returned 37 returns for 736 yards and a pair of touchdowns. Amos is a capable returner, with a 16.7-yard average per return. Running and defensive pressure. Expect a heavy dose of Monroe to take some pressure off of Sokol. He's certainly more than capable at being the focal point of this Rattlers' offense, and giving fits to opposing defenses. Arizona will need to get pressure on Salt Lake quarterback Verlon Reed. Make him uncomfortable and have to create on the fly. May 18 - Spokane Empire (7-4) at Colorado Crush (2-9), 6:30 p.m.
May 20 - Green Bay Blizzard (2-10) at Nebraska Danger (6-5), 5:05 p.m.
May 20 - Iowa Barnstormers (9-2) at Wichita Falls Nighthawks (8-2), 5:05 p.m.
May 20 - Cedar Rapids Titans (1-11) at Sioux Falls Storm (10-1), 5:05 p.m. Earlier this week SCtoC's Bannock interviewed Salt Lake Screaming Eagles head coach Matthew Sauk. It was our second interview with the coach, as Bannock had previously spoken with him in a post on this site on March 12. "We discussed some strong performances by several players over the course of the season. He talked about the keys to turn losses into wins, injuries, being resourceful with filling in the holes left by those injuries, keys to turning losses into wins, identifying with players and coaches looking to move up to the next level, fatherhood, and looking at life outside of football." Check out our exclusive interview with head coach Matthew Sauk below. Great throwback photo of Sauk! I would like to see the Screaming Eagles win this. It would make for an even more intense playoff race (pun intended!). This is a bit repetitive to the preview, but here is the IFL's Media Capsule for this game. I will note that our preview says the game starts at 6 p.m. pacific time and the media capsule has it at 6 p.m. mountain time. It's synonymous since Arizona does not recognize daylight savings time. We're probably about 10 minutes away from kickoff. Let's see if Salt Lake can stop Arizona. I think it's posssible, but it won't be easy. I will be doing to scoring updates and quarter summaries. David may be here for the second half in which case he will take over one of them. Not many people in the arena yet. Touchdown Screaming Eagles. Chris Robinson 34 yard pass from Verlon Reed. Josh Wilson kick failed. FYI: The stats page has not yet started from Phoenix. Perfect pass from Reed to Robinson. Just the start Salt Lake wants. Calhoun back for the Salt Lake defense. Figured that since Dotson started on offense. This color guy for the Rattlers sounds like he is commenting at a second grade level.